Combine tuna, fennel, scallions, carrot and Silver Palate Champagne Mustard Salad Splash in a bowl. Carefully open pita breads about one third of the way. Put a lettuce leaf in each pita. 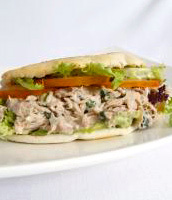 Divide tuna between pitas, spooning it well into the pocket. Add cheese, if desired. Serve at once. If taking the pitas on a picnic, wrap in plastic wrap and refrigerate.